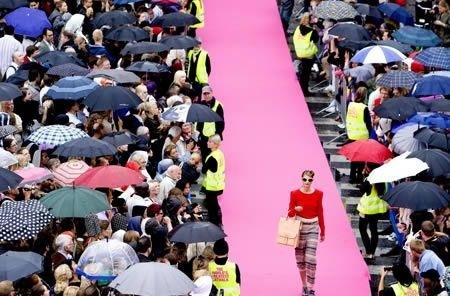 Recently, the Copenhagen fashion Week took the concept of the catwalk and pushed it to the extreme, making their runway models walk a bit more than usual for a fashion show and breaking a World Record in the process. The Copenhagen fashion week saw a variety of shows and each fashion show presented something new and exciting. It was one show however that caught the spotlight as the main fashion show for the event was held on a catwalk that spanned 1,609 metres long. 250 models took part in this particular fashion show and helped break the record of the longest catwalk ever to be erected in Europe. The catwalk took up most of Stroget Street, a popular high end fashion street in Denmark. Danish supermodel Helena Christensen was at the top of her game as she kicked off the fashion show and walked elegantly down the long catwalk.